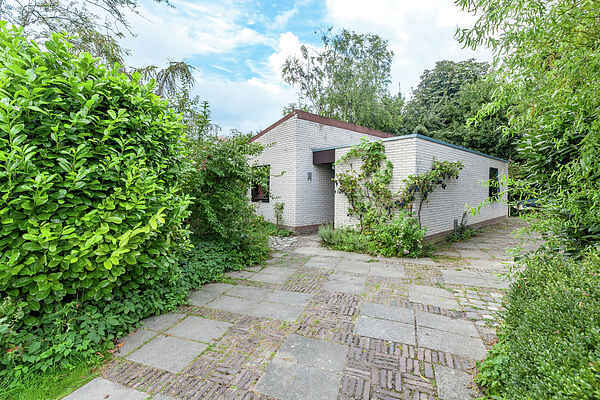 This comfortable, detached bungalow (65 m2) is situated just 100 m from the Veerse lake, in a quiet bungalow park. The Noordzee beach is 4 km away (free parking for the Noord-Beveland beaches) and a sub tropical swimming pool is 6 km away. Bicycle hire possible in Kamperland. On Veerse lake you can take water skiing lessons, ideal for swimmers, surfers, sailing, diving, fishing and canoeing. SITUATION The detached bungalow has on its own premises 400 m2 terraces, lovely gardens, trees and shrubs. Ample privacy. The premises are part of the villa- and holiday house park Ruiterplaat is on the bank of the Veerse Lake. The park borders with the recreation center the Scotsman with accessible facilities for everyone. FACILITIES Within 1 km, such as launderette, camp shop and restaurant, midget golf and tennis. Bus stop within 3,5km distance. Only during tourist season. Beaches, wharf, broad strip of grassland within 100 m along the Veerse Lake shore, suitable for swimmers, surfers, sailors, canoes, and fishermen. Sailing instructions from the park. Within 1-3km marinas, shores suitable for surfers. Sleep lifts, water-skiing, free trailer dock. From 2km forest and other nature areas, suitable for walkers and cyclist, skating and skeelering. After 4km beach with dunes. Restaurants and little beach cabins. Spacious parking possibility for cars, which connects after approx. 4 km to the beach, dunes and forest of the island Walcheren. SEVERAL SUGGESTIONS IN THE DIRECT SURROUNDING Tourist little ferry boat within 1 km to the little town Veere over the Veerse Lake. Round trip over the Veerse Lake from Veere within 14 km. Swim paradise within 6 km at recreation center The Roompot. Free to visit a just restored cornmill in Wissenkerken. The mill is in use and the meal is for sale. Even a manege. Possibility to stay for your own horse at the farm of the caretaker, please contact the caretaker. Via Oosterscheldedam within 4 km to Neeltje Jans with an exposition and attraction park. The historic little cities Veere (approx. 12 km), Middelburg (approx. 18 km), Zierikzee (approx. 22 km) and within approx. 20 km Goes, with outstretched wave pool, and big market and a golf course. Steam train Goes-Borssele. 'The arsenal` and pilot of sea ships at Vlissingen within approx. 28 km. Circuit flight and flying lessons Middle Zeeland within approx. 25 km. Further information over trips etc. can be found in the bungalow and also the Tourist Information Office in Wissenkerke within 8 km. Child's bed, chair and playpen present.